Our little village of Erzenhausen is nestled about halfway up Eulenkopf, a hill that rises about 200 meters above the surrounding countryside. The village is small...we don't even have a bakery. This is comparable in the States to a town that doesn't have a single fast food restaurant! 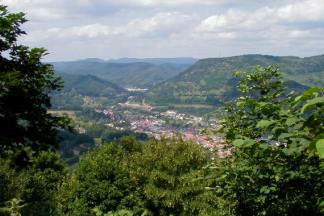 This is a view of the northern side of Erzenhausen from about halfway up Eulenkopf. We discovered a beautiful trail that winds through the forest on the southern side and pops out on the top with a beautiful view. Eulenbis rests at the top of the hill, and they have a tower and Gasthaus right at the highest point. In the distance, Schwedelbach can be seen to the right (northwest), and Mackenbach fades into the haze on the upper left (southwest). The base is just south of Mackenbach. This is a view from just a couple of buildings down and across the street from our home. To the left, is the Kääser Gasthaus. The white pole represents that it was voted the favorite in town this year (there's one other gasthaus, or restaurant/pub). Moving right, you can see the parking lot being constructed for the Kääser. Eulenkopf hill is in the background, and some of the newer homes in town are being built further up the hill. You see a garden and riding ring in the foreground; both are typical sights within the village. Several farmers work the surrounding fields, then keep their tractors in large garages (probably former liveries) right next to their homes. Most people keep a large garden to provide fresh lettuce and tomatoes and a few other vegetables. At least 6 homes keep horses, and they ride by our house on the way to the many trails just outside the village that wind through the countryside. Just across the street, and beyond the big white house on the right, you can barely see our retaining wall that borders our yard. 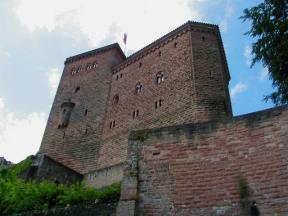 Trifels is a castle perched atop a sizable hill in the Pfälzerwald (Palatinate Forest). The castle itself has a bit of history. Its strategic location protected the route to the Rhine plain. In the 12th and 13th centuries, it was the temporary location of the crown jewels and royal treasury. The castle is made of sandstone blocks quarried nearby, and its base seems to meld into the sandstone outcrop it is built on. Sandi with Riley in the small backpack under an ancient archway. 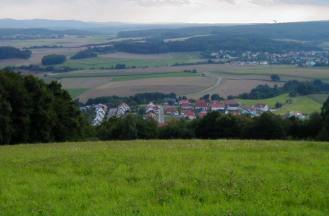 The view from atop the castle, with the town of Annweiler in the valley. I'm not sure exactly what this sword is (it was described in German), but this is a good place to talk about another piece of the castle's history. When Richard the Lionheart returned from the Third Crusade, Emperor Henry IV kept him captive at the fort. The large ransom for his release was used to fund Henry the IV's campaign against the Norman kingdom in southern Italy. 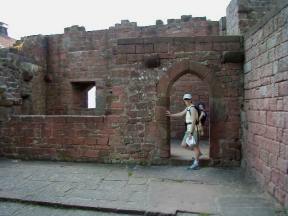 He set off from Trifels 9 May 1194. 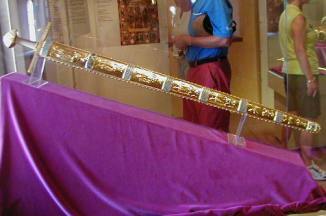 This is probably an example of the crown jewels kept at the castle. 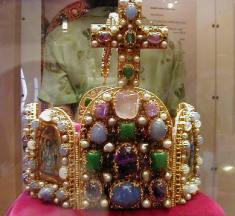 It is also nearly identical to the crown for the Holy Roman Empire. Trier is a city of about 100,000 that sits in the heart of German wine country along the Moselle River. 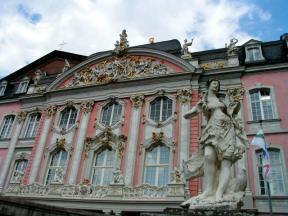 It is the oldest city in Germany, founded around 17 B.C. as the capital of the area between the Rhine and Meuse Rivers inhabited by the Gallic Triveri. The region fell to the Romans during Julius Ceasar's conquest of the Gauls, but was established as a regional capitol during the reign of Emperor Augustus. Its name was Augusta Treverorum, or "Augustus City of the Treveri." Many of the Roman buildings still stand (mostly circa 2nd century A.D.), including two Roman baths, basilika, 20,000 seat ampitheater, and much of the original city wall and gates. With the conversion of Constantine the Great (reigned 306-337) to Christianity, Trier's bishops became increasingly important. From the late 4th to 5th centuries, Germanic tribes crossing the Rhine migrated to the city and then the region came under Frankish-Merovingian rule in the Middle Ages. Latin was later replaced by the language of the Germanic Franks. In more recent times, the French occupied Trier in 1794, and evenutally annexed it. After the defeat of Napoleon, it was integrated into the Prussian Rhine Province in 1815. Karl Marx was born in Trier in 1818. Although much of the old city was destroyed in WWI and WWII, they were rebuilt afterwards. 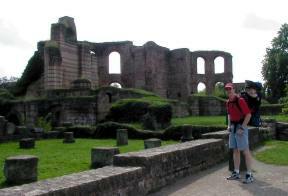 Dale (with Riley in his backpack) posing in front of the remains of the Imperial Baths, or Kaiserthermen. Construction had been interrupted around 312 due to the lack of funds as Constantine focused his political interests on the Mediterranean. When construction resumed, the baths were converted to barracks for the mounted imperial bodyguards, with 800-1000 soldiers plus their horses. The caldarium (warm bath) building visible in this picture became the drill hall/flag sanctuary. In the Middle Ages, it was converted into a castle, "Alderburg." Finally, around 1120, it was incorporated as a corner bastion of the new medieval city wall. The old Roman Basilika (barely visible on the upper left) functioned as a residence for the Trier Archbishops before three additional wings were added to the structure. The southern wing of the Electoral Palace, visible in this picture, was constructed from 1756-1768. It is beautiful, with very detailed sculptures and embellishments gilded in gold. It overlooks a large baroque-inspired garden. 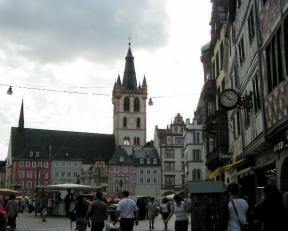 Looking across the Main Market Square (Hauptmarkt) toward the Church of St. Gangolf, consecrated in 1459. Several eras of architecture are apparent, with the half-timbered buildings characteristic of the Moselle region, to baroque and renaissance styles. 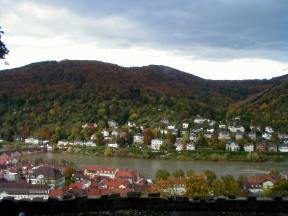 I just had the opportunity to spend half a week in historic Heidelberg for a course at the Army Post. Unfortunately, there was no room on base, so I had to find a hotel on my own (can you hear the sarcasm?). I found a reasonably priced hotel right along the Neckar River (a tributary of the Rhine) in the middle of the old city. 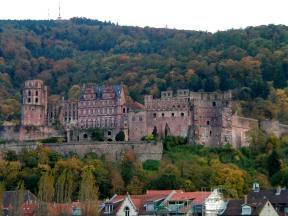 Heidelberg is the location of Germany's oldest university, founded in 1386. It is regarded as a cultural center, and was visted by several renowned poets, authors, and artists. Unlike many other German cities, it was spared destruction in WWII, so many of the historic buildings of the town remain intact. The town has an ancient beginning as the oldest evidence of human life ever found in Europe - a lower jawbone dating back to 500,000 B.C. - was discovered in a wall near Heidelberg in 1907. As far back as 5 B.C., the Celts had a fortress on the Heilengenberg, the mountain overlooking the village. The Romans had a permanent camp and signalling tower along the banks of the Neckar from about 80-260 A.D., and under their protection, settlements first began to develop. Through time, two castles were mentioned on the Heilengenberg, one at the very top, and one where the present castle sits. Its strategic location made life difficult for the residents, who had to evacuate a few times and rebuilt after it was razed in 1689/93. 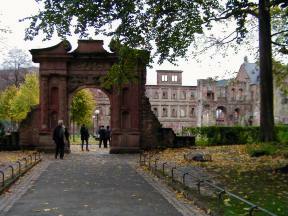 In more recent history, Heidelberg was the location that the Tsar of Russia, Emperor of Austria, and the King of Prussia met to form their "Holy Alliance" against Napoleon, and the castle ruins were illuminated by an enourmous wood fire in their honor. Even now, the castle is illuminated at night, and is a beautiful site from the old bridge crossing the Neckar River. A view of the old city from across the Neckar River facing the Alte Brücke, or "Old Bridge," which was built My hotel, called the Goldener Hecht, or "Golden Pike" - founded in 1717 - is just to the right of the bridge gateway. I loved walking onto the river and enjoying the scenery. Giant barges moved up and down the swift-flowing river. The bridge and Brückentor ("bridge gate") were built in 1786-88. Scores along the pillar nearest the gate mark the high water points and dates of historic floods. 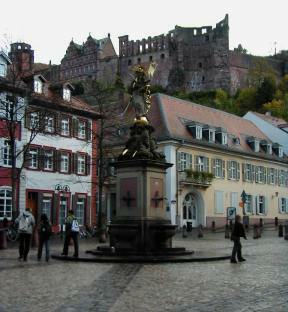 Just to the left of the above image is the view of Heidelberg Castle rising above the city. It sits atop a rather steep hill, and is in remarkably good condition. It was built in sections by the Prince Electors from about 1400 to 1620. It was partially destroyed during the Palatinate Succession, and then again by lightning in 1764. A view from the back of the castle. The arch is the Elisabethentor, or "Elisabeth's gate." Prince Elector Friedrich V had it built in 1615 in one night as a gift for his English royal princess, Elisabeth Stuart. It forms the entrance to the Stückgarten, or "gun garden," that doubled as a pleasure garden and bulwark where guns could be placed. Looking to the north from a terrace at the castle. 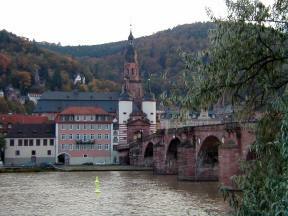 The old bridge can be seen to the far left spanning the Neckar River. The Alt Stadt ("old town") that came into existence around 1200 is on the southern banks of the river. Beautiful fall colors adorn the hillside to the north (although washed out a bit in this picture taken right after a rainstorm). On the hill to the right there were several vinyards along its steep slopes. The Kornmarkt ("corn market"), with a nice view of the castle as it rises above the town. The statue with the Kornmarkt-Madonna, was created by Peter von den Branden in 1718 under commission by the Prince Elector. To the left is Heidelberg's historic luxury hotel, the Prinz Carl. Such famous people as Kaisers Wilhelm I and Friedrich III, General von Moltke, and Mark Twain have stayed there.